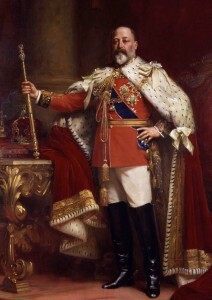 In 1902, two days before he was to be crowned, the future King Edward VII was diagnosed with appendicitis and in need of emergency surgery. Even though only briefly mentioned in chapter 51 of Bloodlines -Traces; describing a much talked about moment in the history of the British Empire, can take up a lot of time. As authors we feel responsible for reproducing fact in faction, and go on a quest to find out what really happened, which , as the proverb says, can be stranger than fiction. Carried away on the wings of imagination, we also at times loose ourselves in creating new history. It is interesting to observe how different details of a subject seem to pop up from different angles in real life, once the process of writing about something has been initiated. Documentaries on ‘Bertie’ that we didn’t know were on, unexpectedly appeared on television. Family members with ‘appendicitis stories’ to tell, rang the doorbell. The cousin with the appendicitis story would also have rung the doorbell when the author had not been writing about Edward VII; and the television documentary would also have been scheduled and probably even seen ‘by chance’, when the topic had not been of extra interest. It is the mere fact the subject is just ‘as it happens’, being written about, that makes it more noted. But is that really all there is to it? The creative process of writing follows mysterious trails. In Bloodlines – Touch Not the Cat, for example, while describing the possibility of somebody drowning in the strong current of the river Spey in 1896, a real life 2012 news paper article literally gave us an example we could then include into the narrative. And after describing American Universities around 1910 only admitting white people; Tom stumbled upon a complete centerfold article in a Scottish newspaper, on an Afro-American who came to study law at Glasgow as no American university would accept him. As a matter of fact, while doing research for this blog, using ‘afro american university glasgow 19th’ as tags for the search engine, a website popped up, about rival medical schools, holding an article on Joseph Lister. Now guess who Joseph Lister was: He was the surgeon who operated on Bertie and basically the only piece of information that ended up in Bloodlines -Traces, after all the research we did. “Appendicitis can be a killer Mary, though they have made a lot of progress on anaesthesia and antisepsis over the years. I’m sure he will be treated by the best surgeons.” She wondered if Joseph Lister from Edinburgh would have been summoned to London. Makes you wonder doesn’t it? Which was first? The chicken or the egg?